For all intents and purposes, the Bourne franchise has been batting 1.000 with Matt Damon in the lead role. The Bourne Identity came out with a surprise blend of espionage and gritty action, and its follow-ups, The Bourne Supremacy and The Bourne Ultimatum, continued that legacy. Speaking of legacy, it’s best to forget the Jeremy Renner-led spin-off The Bourne Legacy, which proved that it is Damon (and in part director Paul Greengrass) that makes the franchise tick. So then, with Damon and Greengrass back on-board, ;Jason Bourne should have been a hit, right? Unfortunately, the development of modern action movies has passed Jason Bourne (both the character and the film) by, and what’s left is a generic action movie with a boring plot and formulaic characters. Jason Bourne‘s plot follows a very predictable path. After spending years in seclusion, the former Treadstone agent/assassin makes an appearance, and in the process uncovers deep-seeded government corruption with ties to his own past. There’s another super-assassin on his tale as well, because that’s what the formula tells us must happen in these films. It’s as if the filmmakers simply dusted off the Bourne blueprint and thought most would forget how previous stories played out. Truthfully, from the fight sequences to the chases, Jason Bourne has a very familiar feeling. And in certain circumstances that’s not necessarily a bad thing, but the assumptions that what was fun and exciting in the late ’90s and early ’00s is still going to work aren’t just wrong, they hurt the film. Car chases in the early Bourne films were all about practical stunts and realism, but so many films have equaled or surpassed what those Bourne filmf have done. In fact, most modern action films take practical car chases to new levels, while Jason Bourne is busy relying on quick cuts and head-on collisions to deliver its thrills. Again, in the ’90s, these car chases would have been exciting and impressive, but now they are old hat. In a much similar vein, the fight sequences in Jason Bourne don’t have the punch that they used to in the previous movies. Whether that’s a byproduct of Damon’s age is unclear, but the quick cuts and shaky cam confuse and hide the action more than they heighten it. It’s a trick that Paul Greengrass has used to great effect in previous movies, but here there’s clearly a sense of obfuscation, more so than in prior films. To Damon’s credit, he is in great shape and the action is brutal, but it doesn’t feel as fresh or exciting as it should. Too many quick cuts, snap zooms, and unnecessary close-ups prevent the audience from ever getting a clear picture, and the choreography is pretty standard as well. At one point, the Bourne films were riding high in the action movie genre, with a perfect blend of exciting sequences and a compelling story. Now, however, the action isn’t s exciting, the characters are not as dynamic, and the story is extremely predictable. Jason Bourne is fine for a mindless matinee, but that’s a low bar for a film series that used to be the pinnacle. Now, Jason Bourne is just another action movie sequel that may have rested a little too comfortably on past accomplishments. 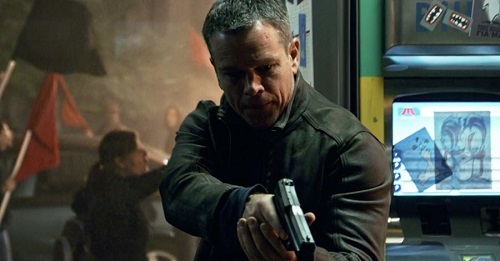 As was mentioned previously, the action in Jason Bourne is nothing to write home about. Foot chases, car chases, and a few hand-to-hand fights are on a typical Bourne menu, and that’s true once again. Unfortunately, the foot chases are bloated in the worst way and have no sense of excitement or pace. The car chases rely too heavily on generic car chase tropes. And the fistfights don’t have the pop that previous films once did. It’s as if the guerilla style of filmmaking and creativity is lost on this latest Bourne film, and instead things are much more generic. 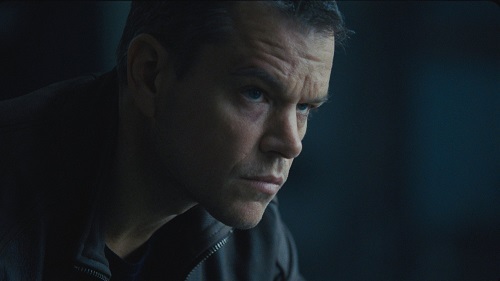 What happened to the days of Bourne taking out a bad guy using a book or a pen? Some will find enjoyment in the action in Jason Bourne, but it’s all surface level stuff. The sense of creativity and variety is lost on this latest film and that’s its biggest crime. You go to a film like Jason Bourne for action that outpaces the other guys, but here, the film has nothing that sets it apart.